Soon after Motorola announced the Moto X 2014 edition in September, it was one of the best smartphones in the market. With the launch of the Nexus 6 by Motorola and Google, the Moto X 2014 might look like a member of Nexus family and perhaps the successor of Nexus 5. 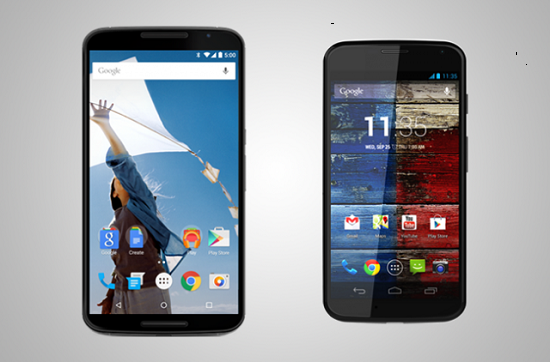 Of course, the Nexus 6 is pretty similar to Moto X in many ways, but it is bigger and is more powerful. For those who are seeking to own a flagship smartphone, here is a comparison between the two. The Moto X 2014 is given a 5.2 inch AMOLED display with a FHD resolution of 1920×1080 pixels and a pixel density of 424 pixels per inch. On the other hand, the bigger Nexus 6 has a spacious 5.96 inch AMOLED display with a vibrant Quad HD resolution of 2560×1440 pixels that results in an increased pixel density of 493 pixels per inch. Both the screens are layered with the scratch resistant Corning Gorilla Glass 3 protection. Being AMOLED panels, both the displays will consume the battery life of the smartphones efficiently. To conclude, both the smartphones are pretty similar in terms of display except for the fact that the Nexus 6 has a bigger display with increased pixel density. The primary difference lies in the other aspects of the smartphones. The Moto X 2014 employs a Snapdragon 801 quad-core processor ticking at 2.5 GHz clock speed teamed up with Adreno 330 graphics engine and 2 GB of RAM. Going by the comparison, the Nexus 6 is stuffed with a quad-core Snapdragon 805 graphics unit that is clocked at 2.7 GHz and is aided by Adreno 420 graphics engine and a bigger 3 GB of RAM. Obviously, the Nexus 6 is a powerhouse and it will have more applications in the background without interfering with the performance making it better than the second generation Moto X. The primary camera in both the Nexus 6 and Moto X 2014 are not too different as they house a 13 MP primary camera with auto focus, dual LED flash and support for 2160p video recording. Also, they arrive with a 2 MP front facing selfie camera onboard for video conferencing. The ultimate difference is that the Nexus 6 comes with dual LED Ring flash and optical image stabilization. The Nexus 6 is better as it renders better video recording in motion and HDR+. While the Moto X 2014 arrives in 16 GB and 32 GB of internal storage capacities, the Nexus 6 comes with increased storage space of 32 GB and 64 GB respectively. Anyways, both the smartphones lack an expandable micro SD card to enhance the storage space externally. The battery capacity in the Moto X 2014 is a 2,300 mAh that is claimed to render a moderate backup of 8 hours of battery life in just 15 minutes of charging as it is equipped with the Quick Charge 2.0 feature. On the other hand, the Nexus 6 is stuffed with a 3,220 mAh battery that also supports turbo charging providing 24 hours of talk time and 330 hours of standby time on just 15 minutes of charging. Furthermore, the Nexus 6 also supports Qi Wireless Charging as well. The major different between the both is that the Nexus 6 is fueled by the Android 5.0 Lollipop out of its box, whereas the Moto X 2014 is based on Android 4.4.4 KitKat and is upgradeable to Android L. With the Android 5.0 Lollipop pre-installed, the Nexus 6 comes with the all new Material Design, more responsive UI, more efficient ART Runtime, 64 bit processing support, battery saver mode and others. The Moto X 2014 is priced at Rs 31,990 for the basic model and Rs 33,990 for the Wood and Leather variants respectively. However, the Nexus 6 is expected to carry a much heftier price tag. If you do not mind about the pricing, the Nexus 6 is a great device in the market with the authentic Android Lollipop experience, larger display, powerful imaging hardware, great processing power and a solid design. The Moto X 2014 is not a weak contender as it comes with a processor that is also extremely powerful making it a wonderful smartphone. Choice primarily depends on which size you would rather prefer.